Taken with Olympus E500 digital camera April 30th 2008. Click image for larger view. Small Tortoiseshell (Nymphalis urticae) butterflies has awaken from their winter hibernation and are flying around in the warm sunshine. 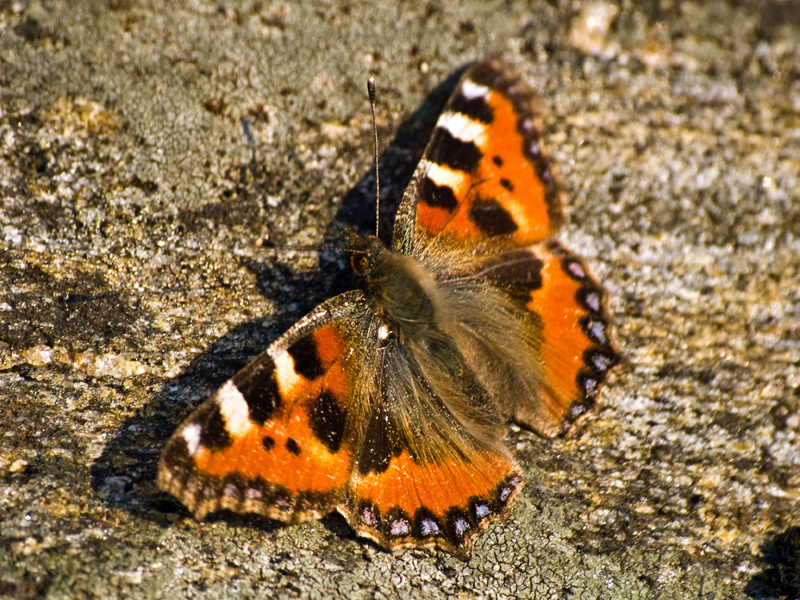 Small Tortoiseshell is the first “day butterfly” that one can see here in Northern Norway in the spring, often on the first warm day. They are really beautiful, don’t you think? The Norwegian name for the Small Tortoiseshell is “Neslesommerfugl” which means Nettle Butterfly in English. The butterfly got that name because they lay eggs on nettle plants and their larvae eats nettle leaves. I have seen nettles completely covered with black Small Tortoiseshell larvae. Check out my other insect photos here. Yes, they are beautiful! I’m just a little partial to the color, orange. Hehe. I love butterflies. They’re like flying flowers. This sure is a pretty one. Lovely, they’re such great subjects for photography. Me too, I love butterflies. Very nice shot! Show how little I know about Norway.. (I was there 10 yrs ago) but I didn’t even know you had much in the way of butterflies.. And he is a lovely specimen..
Lovely photo we have noticed a few butterflies around lately as we are having a hot spell here in the UK. What a beautiful picture and a lovely proof of spring in Norway – good to see the nature our of hibernation! I like the orange and brown mix on the wings. Your macro pictures of insects are wonderful.